A Romford based Shakespearean group of players need Helen Bonham-Carter. Well not actually the great actress, but a young lady who can reprise her performance of Olivia as played in Trevor Nunn’s film, Twelfth Night. Director of Romford Summer Theatre’s version of the Shakespearean classic, Vernon Keeble-Watson, needs a very special actress to play the role in the forthcoming production in June. She can be 18 to late 20s, and the other requirement is a bit of a voice, as it is outside in the open air of Raphael Park in Romford. Olivia is mid 20s and of noble birth and in mourning for her brother, but she in turn is the object of the affections of Duke Orsino. Both are extremely well heeled yet turn melancholy into an art form, with Olivia vowing to pass seven whole years veiled like a nun, consecrating her life to sorrow for her dead brother. However, all that is thrown out of the window when she stumbles upon the man of her dreams, Sebastian. He, as it turns out, is she, the twin sister of Sebastian. Her name is Viola, and she poses as a man dressing in her brothers clothes and also calling herself Sebastian. The twins were separated when their ship foundered on rocks with both believing the other to be dead. However, all ends happily after a thorough stirring by the Bard, allegedly aimed as a swipe at some of the less desirable characters in Royal Court of Elizabeth. The production begins rehearsal in early April with three rehearsals each week and seven performances spread over two weeks in June. Vernon would like to hear from Helen (left), but it could be a Jane, Emily or Sharon for a brief audition. Shakespeare is superb to act in and not the equivalent to the old school dentist feared by some. 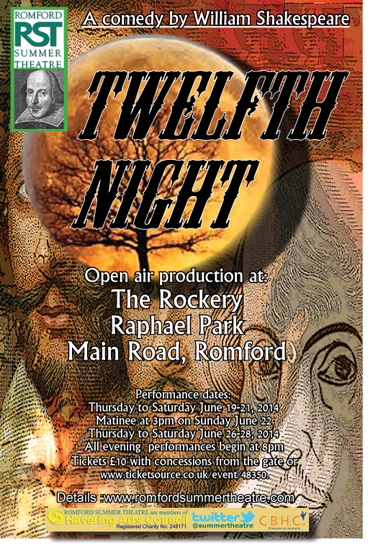 The players immerse themselves in the Bard’s work because it is fun and the stunning set on the Rockery in Raphael Park is lit transforming it into a vast atmospheric theatre under the stars.